Tailgate Light Bars and Side Bars - Fire and Ice LED Tailgate Strip (Red Brake/Turn Lights, White Reverse Lights) 36" to 60"
Home > Categories > Lighting: Headlights, Fog Lights, Tail Lights, Replacement Bulbs > Tailgate Light Bars and Side Bars > Fire and Ice LED Tailgate Strip (Red Brake/Turn Lights, White Reverse Lights) 36" to 60"
Fire and Ice LED Tailgate Strip (Red Brake/Turn Lights, White Reverse Lights) 36" to 60"
Product Reviews for Fire and Ice LED Tailgate Strip (Red Brake/Turn Lights, White Reverse Lights) 36" to 60"
NEW MODEL! Flexible and able to be cut to exact length desired. When cut, the silicone in the item will automatically water seal the item, so it will remain 100% waterproof. This new model can also be installed inside the rear window if desired. Fire and Ice LED Tailgate Bar: Third brake light, turn signal and reverse light! No drilling required for installation of the Fire and Ice LED Tailgate Bar! The new Fire and Ice design is a 2 piece design, so you can allow a small space in the middle for your spare tire drop down (if needed)! 90 red and white LEDs on this bar are enough to be sure that you have the brightness you're looking for with the Fire and Ice LED Tailgate Bar. 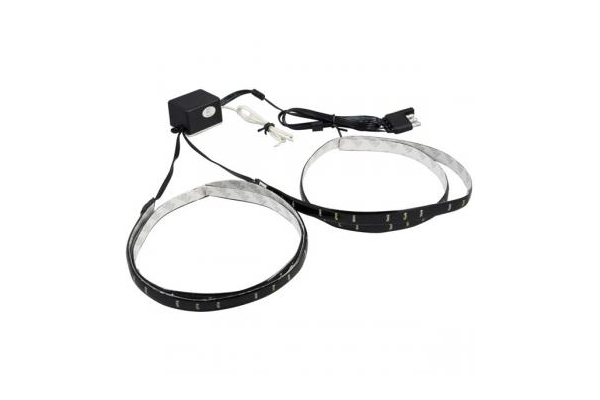 Self adhesive pads mount the LED Brake Light to your truck and a 4 pin trailer-style connector integrates the LED Brake Light into your trucks signal system. Fire and Ice LED Tailgate strip: Order yours today! STEP 1: Clean the area between your tailgate and bumper thoroughly with warm soap and water. The adhesive on the mounting pads of your LED Tailgate Strip will only work once, so the installation area must be free of dust, dirt, and rust, and must be COMPLETELY DRY before installation. STEP 2: Measure the width of your tailgate and determine the midpoint of this distance by dividing the length by 2. Mark this midpoint, then measure on either side of this mark, and mark the two new points as well to determine the left to right orientation of the LED Tailgate Bar to insure that it is centered. STEP 3: Peel the backing off all of the adhesive pads on the back of the Tailgate Bar and press it very gently onto the vehicle between the marks from Step 2. Step back from the vehicle and make sure the bar is mounted straight. Detach and reapply the pads if necessary to correct the placement. STEP 4: Once the LED Tailgate Bar is attached, simply plug in your 4-pin Trailer Hitch Connector. This Trailer Hitch Adapter 4-Way Splitter is just what you need if you are installing aftermarket lighting and don't want to have to unplug it every time you need to hook up your trailer lights. Simply plug the 4 Pin Trailer Plug Splitter into your existing trailer light plug and you'll immediately have 4 plugs ready for use. Installation only takes seconds.